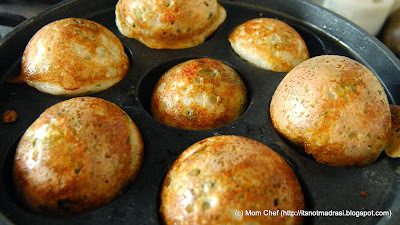 Paddu (Kannada) / Kuzhu Paniyaaram (Tamil) / Gundu Ponglu (Telugu) is one quick snack /breakfast item that we make infrequently. 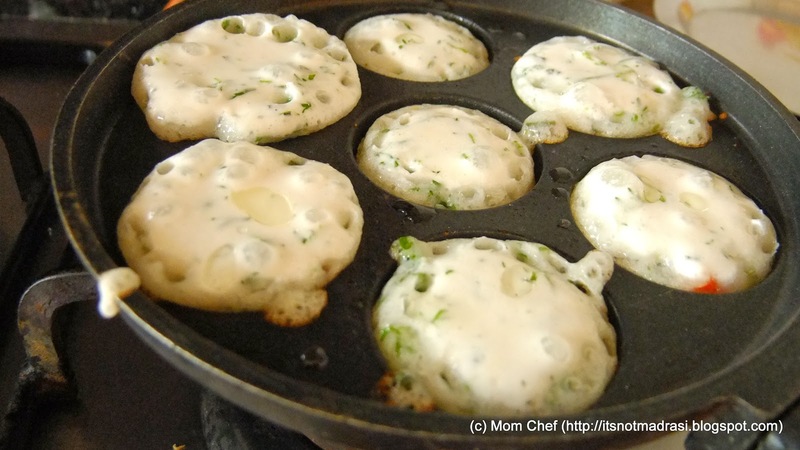 Its a South Indian Dish that is made with this appliance. The batter for this dish is made exclusively for Paddu, but I use the Idli batter itself, and it turns out just superb ! These crusty golden roundels are a treat to make and eat, and is a quick snack for kids and guests too and goes well with the fiery Onion-Tomato Khara Chutney. 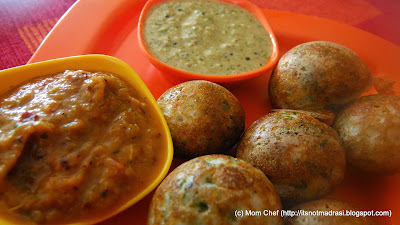 I have given the recipe for both the dishes - Paddu & Chutney here. 2) Spoon into the greased moulds till 3/4 full. 3) Cover and cook till golden brown on a slow flame. 4) Flip slowly with a flat teaspoon and cook on the other side. 1) If you are making this combo for kids, avoid chillies altogether. The ginger will provide enough punch. 3) In case you run short of this batter with unexpected guests, add 3 tbsp of dry roasted semolina / rava to increase the volume and adjust seasonings accordingly.